The founder of Myofascial Release Massage is Howard Rontal, Certified Heller Work Practitioner. Fascial tissue is a white membrane which wraps all parts of a muscle-muscle bundles and fibers. About 40% of a muscle is fascial tissue. Fascial tissue is continuous throughout the body. It also wraps bones, organs, nerves, and blood vessels. Healthy fascial tissue is soft, pliable, stretchy and slick. As we age, for reasons of physical trauma, disease, and habit patterns, the fascial tissue becomes hard, dense, inelastic and short. With the myofascial release massage, the fascia tissue can be transformed to a healthier state. The creators of Manual Lymph Drainage are Dr Emil Vodder and Dr Estrid Vodder in the 1930s . These doctors created this modality to treat chronic sinusitis and other immune disorders. While working on the French Riviera treating patients with chronic colds, the Vodders noticed these patients had a common thread: swollen lymph nodes . In the 1930s, the lymphatic system was poorly understood. The Vodders were not deterred by this and, in 1932, began to study the lymph system, developing light, rhythmic hand movements to promote lymph movement. In 1936, they introduced this technique in France , and after World War II, they returned to Copenhagen to teach other practitioners to use this therapy. 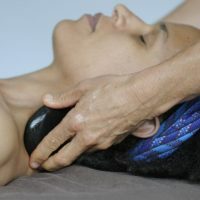 MLD is a gentle, non-invasive technique of slow, rhythmic strokes used to move the skin in the direction of the Lymph flow and desired drainage direction of the lymph fluid. This profound technique stimulates the Lymph nodes and lymph vessels and increases the lymphatic flow. WHO CAN BENEFIT FROM MLD?? promotes the process of detoxification. It has a great benefit for patients with primary or secondary lymphedema or for those at risk of developing lymphedema. It CAN assist with the process of pre/post operative procedures (WITH PHYSICIAN’S APPROVAL), reduce fluid retention and edema, accelerate healing and minimize pain. The goal of MLD is to redirect the flow of Lymph into healthy Lymph vessels. The most common type of massage is Swedish massage therapy. It involves light, long, kneading strokes, as well as light, rhythmic, tapping strokes, on the topmost layers of muscles. By relieving muscle tension, Swedish therapy can be both relaxing and energizing. Some say it may even help after an injury. Deep tissue massage is beneficial for giving attention to certain painful, stiff “trouble spots” in your body. The massage therapist uses slow, deliberate strokes that focus pressure on layers of muscles, tendons, or other tissues deep under your skin. Deep tissue is less rhythmic than other types of massage and can be quite therapeutic — relieving chronic patterns of tension and helping with muscle injuries, such as back sprain. Your massage therapist will use smooth, heated stones and will place them on the body as well as use them during your massage. The heat can be both deeply relaxing and help warm up tight muscles so the therapist can work more deeply onto specific points of the body (such as the back). Trigger Point therapy involves applying pressure to tender muscle tissue in order to relieve pain and dysfunction in other parts of the body. It was developed by Dr. Janet Travell from the U.S. Trigger Point Therapy is incorporated into your therapeutic massage. Your body goes through major changes. Pregnancy massage can help with these changes by reducing stress, decreasing arm and leg swelling, and relieving muscle and joint pain. Massage may be particularly helpful during a time when medication and other medical options may be more limited. Your therapist will use a variety of pillows to obtain the most comfortable position for the massage.